Description: In 1977, a young nurse was working in an OB unit of a major West Virginia hospital. She stumbled upon a LIVE baby, placed in a “dirty utility room” and left to die. What she did not realize is that Roe vs. Wade had just been passed by the U.S. Supreme Court and this atrocity was indeed legal. 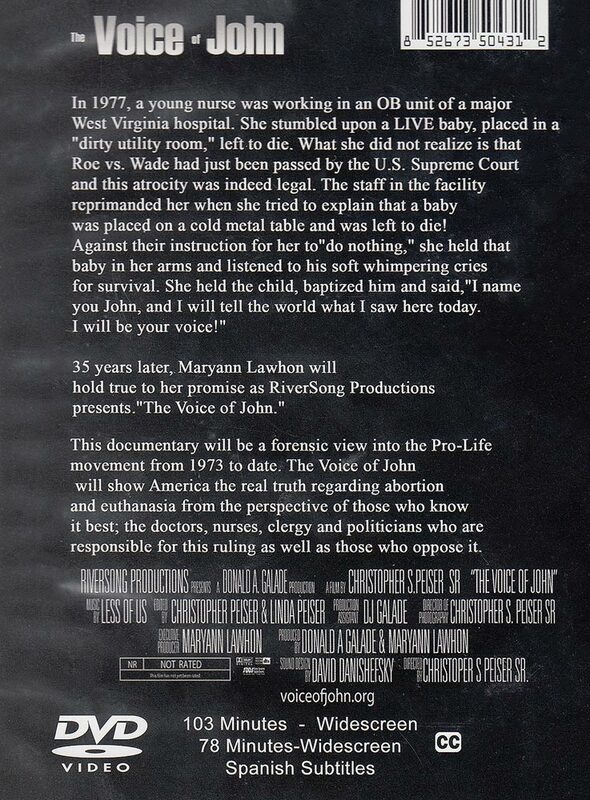 This documentary will be a forensic view into the Pro-Life movement from 1973 to date. The Voice of John will show America the real truth regarding abortion and euthanasia from the perspective of those who know it best; the doctors, nurses, clergy, and politicians who are responsible for this ruling as well as those who oppose it. Classroom Edition 78 Minutes.